An interesting article from Bhakta Kripa prabhu wherein he rises up to defend HH Bhakti Caru Swami. For the record, I have been trying to get in touch with HH Bhakti Caru Swami for several years now, all to no avail. A bit of a joke, really. Somehow or other, HH is never available. I do not know what HH Bhakti Caru Swami does or does not do in the rest of the world, but I do know what he does or does not do when he flies into Bhaktivedanta Manor. The said Swami's own disciples tell me. 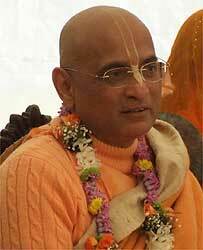 HH Bhakti Caru Swami comes to ISKCON UK on a regular basis, usually to collect cash. Rumour has it the Swami has just been given a duff diamond by one of his followers, tut tut . Some of his disciples complain to me that he rarely, if ever, asks them about their spiritual welfare. He has a cosy relationship with the local management wherein they openly flatter each other. Maharaja's feet rarely, if ever so to speak, get off the red carpet. no more cash for HH Bhakti Caru Swami! Just what is HH Bhakti Caru Swami preaching?